As outsourced parts keep getting better and often less expensive, a woodshop really needs to know whether it’s more profitable to buy components, or still make them in-house. On the surface, that seems like a simple spreadsheet task – just compare the numbers. One can quickly assess the cost of outsourced parts by simply looking at an invoice. But how does a shop owner or manager figure out the real, actual cost of building something? Yes, there are numbers for inventory, and software apps that will time a job and paint a pretty close picture of the man hours, but there are also many intangibles. Take, for example, the installation. 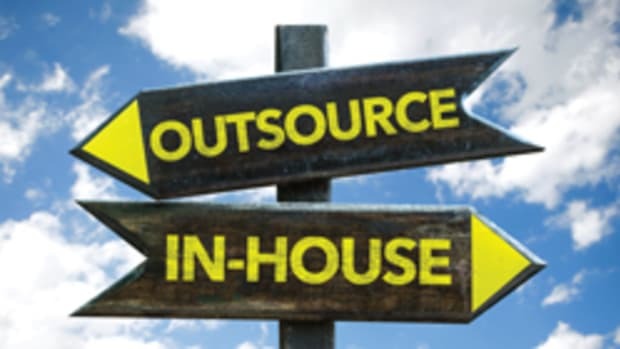 Even with reliable numbers on a job that make accurate allowances for overhead, one can’t just compare the cost of a job going out the shop door to one coming in from a factory. What if the outsourced cabinets are flat packed and need to be assembled? That time needs to be added to the invoice, as do shipping charges. But the real challenge lies in hidden costs. How much time went into researching, finding and ordering completed parts? Were any compromises made because the supplier only works in specific materials, or builds to predetermined dimensions? Are the hinges as good as the ones we use, or the slides? How much time will we spend trying to match a finish (stain and coatings) on parts built in-house to those ordered elsewhere? Can we even match the grain and color exactly? After all, red oak from Minnesota looks different than the same species from the Appalachians. Surprisingly, most of the larger suppliers can give very positive answers to those questions, because they have dealt with them so many times. Outsourcing has changed a lot over the past few years, and sometimes the decision to buy in components isn’t only about the money. 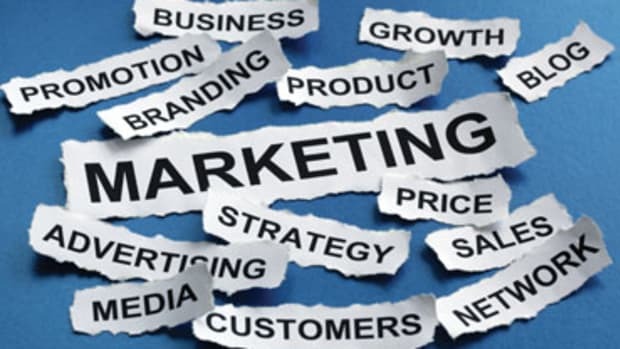 For example, most suppliers are constantly upgrading their stock catalogs, so even a small shop can expand its offerings and attract new customers. WalzCraft in La Crosse, Wisc., manufactures custom cabinet doors, drawer boxes, moldings and many other varieties of cabinet components and accessories, either unfinished or prefinished. The company is family owned and employs about 270 people. Its website (walzcraft.com) is well organized and easy to navigate, especially for shops just entering the world of outsourcing. Among the latest offerings in the WalzCraft catalog are six high-pressure laminate (HPL) stock colors from Formica that are available in contemporary slab style doors and drawer fronts, as well as custom pressed stock and laminate sheet stock. The new colors are muted but sophisticated, and may indicate a slight change in consumer trends this year. 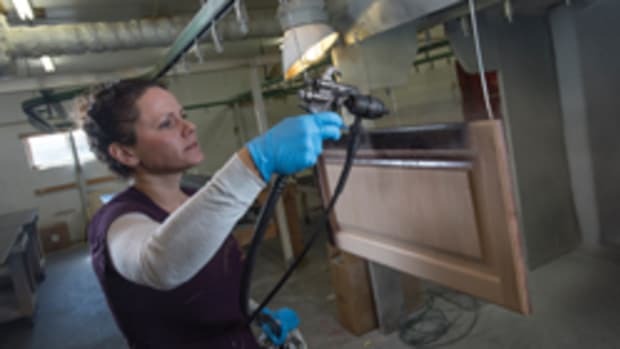 Elias Woodwork (eliaswoodwork.com) in Winkler, Manitoba, has added a few new items to its catalog this summer, including the Signature Craftsman arched range hood series that can be finished to match existing doors and other accessories in stock or custom paint or stain. Elias also just introduced the Rockport door, a one-piece RTF door with sharp, routed corners that closely simulate a raised panel, five-piece mitered door. It’s offered in a thermo-foil version that offers an economical alternative to wood and comes with a vast selection of solid colors and wood grain patterns. This product is ideal for environments with changes in heat and moisture, where joints can be susceptible to expansion and contraction. And that translates into fewer warranty issues for the woodshop, and a long-lasting product that is scratch and stain resistant. Decore-ative Specialties is a family-run manufacturer of custom cabinet components with three locations in California, including a main office in Monrovia and manufacturing sites in Irwindale and Elk Grove. In business since 1965, the company also operates a plant in Monroe, N.C. Over the years, the Lansford family has been at the forefront of environmental improvements in the industry, and today offers woodshops the option of going with traditional solvent-based coatings manufactured in its Monroe facility, or water-based finishes that it makes in Irwindale. Decore-ative also offers Streamline ready-to-assemble (RTA) cabinets that ship in six to 10 days and feature blind mortise-and-tenon construction. 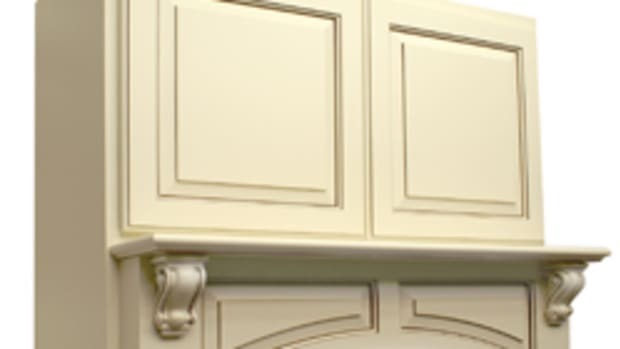 Lancaster, Pa., has been home to Keystone Wood Specialties (keystonewood.com) for more than 40 years, and the company supplies cabinet doors and drawer fronts, dovetailed drawer boxes, cabinet face frames, molding, wainscoting, panel arches and more. One of its specialties is lock miter construction – a solid, locked glue joint that can be specified in any angle from 90 to 140 degrees, for either inside or outside corners. Available in any wood species, finished or unfinished, lock miter construction opens possibilities for geometric creativity and creates, strong dependable glue joints. Another longtime supplier, CabParts in Grand Junction, Colo., has been building casework for woodshops since 1987. Its factory builds fully custom or modular, easily-assembled, frameless cabinet boxes and closet components that are shipped flat-packed. In business since 1964, Conestoga Wood Specialties (conestogawood.com) in East Earl, Pa., has a plant in Kenly, N.C., so the business went through a harrowing few days as Hurricane Florence arrived. Fortunately, the facility escaped major damage and after dealing with some power outages and employees not being able to make it to work, they’re back up and running full bore. Deliveries were interrupted for a while because of highway and Interstate closures, and those are back on track, too. Just prior to the storm, Conestoga introduced three new door styles. Silvana is a one-piece paintable HDF door (no drop-in panel) with 2-1/4” stiles and rails, except that the drawer top and bottom rail are reduced to 1-1/2”. It’s a simple design, but quite striking. The new Glasgow door and drawer front feature square bead stiles and a double stepped framing bead on 3” wide rails. And the new Geneva mortise-and-tenon design has 2-5/16” square bead stiles and 3” rails with any one of six distinctive framing beads on the top and bottom rails. 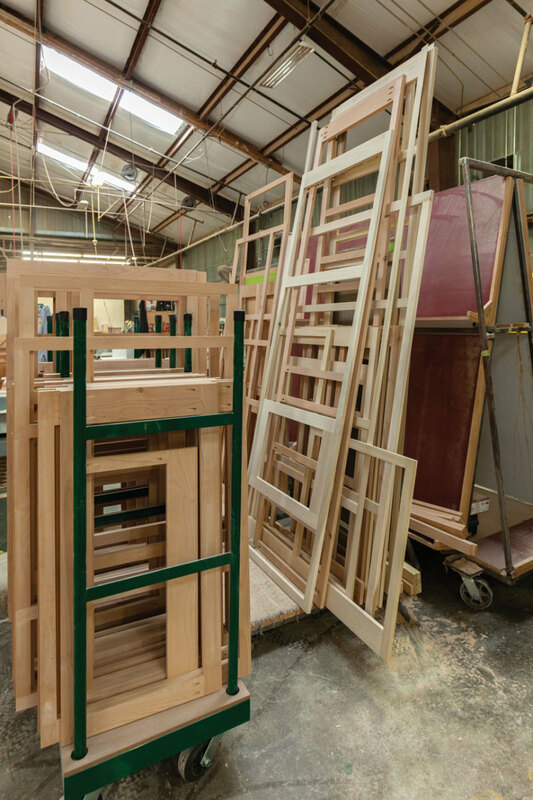 Family-owned TaylorCraft Cabinet Door Company’s 140,000-sq.-ft. plant is near Austin, Texas, and the company supplies unfinished wood cabinet doors and drawer fronts to the trade. This summer, its website (taylorcraftdoor.com) noted that farmhouse cabinet doors are trending, and those tend to get finished in white or very light colors. Farmhouse cabinet doors range from traditional raised-panel, cope-and-stick designs to simple, flat-panel, Shaker-style doors. And to add the look of shiplap, their customers often use V-groove panel doors. Another family business, Canary Closets & Cabinetry (canarycc.com), makes its home in Union, N.J., and one of its specialty areas is closet design. To that end, the company offers a Closet Pro software package that allows woodworkers to design and sell closet components after a very short learning curve. They can see instant pricing and, with the aid of video tutorials, create proposals complete with drawings in short order. Cabinets Quick! in Orange, Calif., is celebrating a decade in business this year. For shops looking for ideas to dress up a kitchen design, there’s a page of inspiring videos on its website (cabinetsquick.com). Hall’s Edge Inc. in Stamford, Conn., makes custom CNC cabinet parts and components for professional cabinetmakers. It offers machining, edgebanding, MDF doors and programming services. Northern Contours Inc. (northerncontours.com) is headquartered in St. Paul, Minn., and has manufacturing facilities in Minnesota, Kentucky and Arizona. 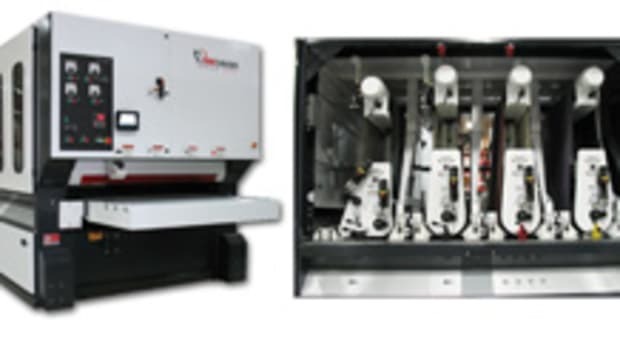 With more than 450 employees, its catalog offers everything from cabinet doors and veneer inserts to membrane pressed surfaces, panels, and other intricate components. Polymer manufacturer REHAU Industries has a cabinet door division with an online presence at rehau.com. There are no worries here about being a small supplier: REHAU is a global company with more than 20,000 employees and 170 locations around the world. For a lot of smaller shops, the biggest challenge is building drawers. They take time because there are so many parts (six with a front), and usually so many of them. And while the preferred traditional method, dovetailing, adds elegance to a project, it also adds a lot of set-up, machining, glue-up and sanding. For shops without a CNC router, drawers can really eat up the days. So, it’s no surprise that there are businesses across the country that specialize in this skill and have honed the process so that it is fast, high quality, and still profitable. One of the early pioneers in this field was Max Hunter and his family, who started building drawers 25 years ago. Their shop, Western Dovetail (drawer.com) is located in Vallejo, Calif., and for a long time it only produced dovetailed drawers. But the catalog has grown to include doors (wood, laminate and foil), plus hardware and a growing range of accessories such as divider inserts, knife blocks, and utility or cutlery trays. CCF Industries (ccfdrawers.com) plies its trade in Apollo, Pa., where it specializes in manufacturing dovetailed drawer boxes. Woodshops that provide company president Ken Clifton with custom specifications can receive a quote via fax within one hour, and there’s no minimum order. Back on the west coast, Drawer Box Specialties (dbsdrawers.com) in Orange, Calif., is a subsidiary of States Industries. DBS says that an order placed by noon Pacific Time can ship in just five business days on most configurations. It is also committed to formaldehyde-free resins and to offering customers options that support various green building programs. 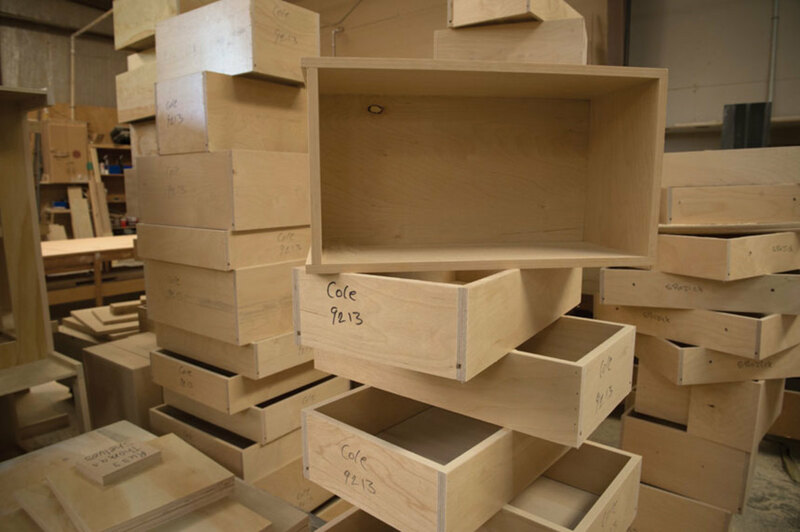 Drawer Connection (dcdrawers.com) in Mesa, Ariz., manufactures dovetail and dowel drawer boxes in melamine on MDF or PBC, or in birch plywood, maple or any of several species of solid woods (ask about FSC-certified products, too). For new customers, there are several videos on the website that walk one through the ordering process. Bill Sandrock is the founder and owner of Stratton Creek Wood Works (strattoncreek.com) in Kinsman, Sandrock has an extensive background in architectural millwork and furniture making. The logo for Timbercraft Custom Dovetail Drawers in New Milford, Conn. (timbercraftdrawers.com) is a maple leaf with green and orange halves that are dovetailed up the middle. The shop purchases only select or better grades of maple and birch, and promises never to recover scrap wood to use in drawers. That’s one of the reasons why Timbercraft doesn’t offer a value, budget, or economy grade drawer – and why cabinet shops trust the name. Top Drawer Components (topdrwr.com) is also known for a marketing statement: “If you can dream it, we can dovetail it!” And while this creative business is located in Apache Junction, AZ, a woodworker anywhere can quickly feel at home by viewing the 3-1/2-minute shop tour video on the website. It makes you more comfortable ordering. There’s a lot more to modern woodworking than just boxes, drawers and doors. A number of other component suppliers offer pre-made cabinet and furniture parts that can save shop time, increase quality and shorten the order/delivery process for woodshops. Brown Wood (brownwoodinc.com) has been a partner to manufacturers, retailers, distributors, engineers and architects since 1927 and has been FSC certified since 2001. Adams Wood Products (adamswoodproducts.com) has been furnishing the woodworking industry with unfinished solid wood furniture and cabinet components since 1975. All of its manufacturing is done in a factory in Tennessee, and woodworkers can select from a vast inventory of in-stock components or have the shop custom make a part. Alexis Manufacturing (alexismanufacturing.com) is a supplier of complex wood components. Artisans of the Valley (artisansofthevalley.com) offers museum quality period reproductions and original designs by commission including Gothic, Medieval, Tudor, and Renaissance periods, as well as antique and collectibles restoration/conservation services, modern furniture refinishing, onsite furniture repair, and hand carving services. DCT Leathers (dctleathers.com) makes leather and leather-insert desktops for furniture builders who then build their own bases. Excel Dowel & Wood Products (exceldowel.com) offers a wide range of wood products, parts and components for cabinetmakers, furniture builders and door building. Shops that want to add a historical detail to casework can visit Sawtooth Shelf System (sawtoothshelfsystem.com). 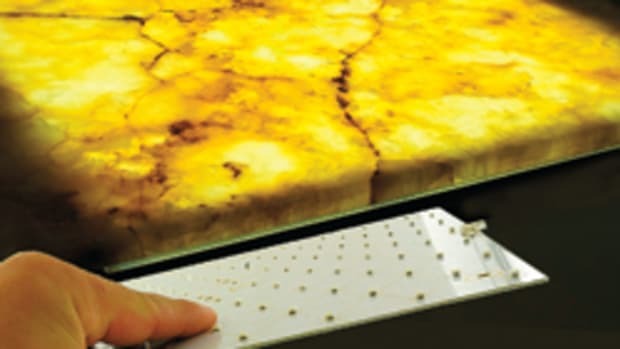 The company has revived a centuries-old method to make adjustable shelves. It consists of wooden saw-tooth uprights in each corner of a cabinet that hold adjustable cleats, and these in turn support the shelves. It’s quite ingenious. Hardware Resources (hardwareresources.com) designs, engineers and manufactures an extensive line of products for the kitchen, bath and closet industries under four brands: Jeffrey Alexander, Elements, Task Lighting, and Hardware Resources. KEhardware.com (kehardware.com) carries a huge inventory of handles, knobs and decorative hardware. The online catalog includes product from the top decorative hardware manufacturers in the industry such as Hafele, Top Knobs, Richelieu, Atlas Homewares and Amerock. Woodworkers who are building stairs or other molding and millwork-based projects can shop more than 200 profiles in ten species at Keim Lumber Co. (keimlumber.com) in Charm, Ohio. And if you can’t find a stock turning there to fit your needs, give Kings Corner Wood Turning & Woodworking (kingscorneronline.com) in Weare, N.H., a call. Specializing in custom woodturning since 1981, the shop does architectural turning, makes furniture parts, and does custom restoration work. 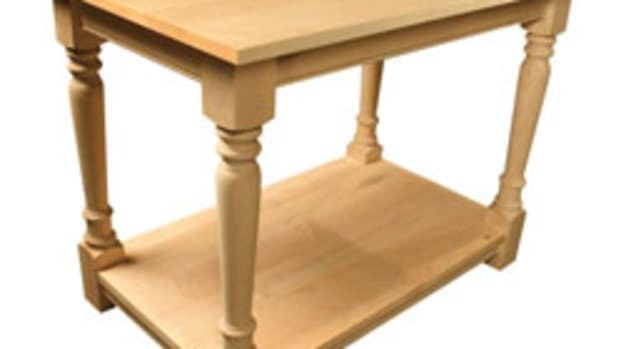 Turnings Unlimited (turningsunlimited.com) in Latham, Ohio, makes custom balusters, spindles, newel posts, table legs, columns, capitals, finials and stair parts. The Osborne Wood Products (osbornewood.com) 80,000-sq-ft. manufacturing and distribution facility is nestled in the beautiful Appalachian foothills of Toccoa, Ga. The company supplies decorative wood components and unfinished parts. The Wood & Shop Inc. (woodnshop.net) offers more than 900 different wooden craft parts with an inventory of over a half a million items. The company also supplies hardwood lumber. Doug Mockett & Co. (mockett.com) supplies fine architectural hardware, including hard-to-find items such as power grommets and cable management, plus drawer pulls, table legs, shelf supports and lots of other accessories. Rev-A-Shelf LLC (rev-a-shelf.com) offers functional residential cabinet storage and organizational products such as Lazy Susans, kitchen drawer organizers, base cabinet and pantry pull-outs, waste containers, LED lighting systems and a childproof locking system. And Outwater Plastics Industries (outwater.com) is into big numbers, too. The company manufactures and distributes more than 65,000 standard and innovative component products. From cabinet and store fixture components to pedestals, carvings, moldings and millwork, the company offers a dizzying catalog that despite its massive range is easy to navigate.